The riots centred on petrol stations across the city, which were unable to pump fuel because of power cuts. The cuts also meant air conditioning and fridges could not work in the stifling summer heat of more than 50C. "There is no fuel and our situation is terrible," said Abdul Karim al-Mussawi, 45, a construction worker. Protesters also accused Kuwaitis of involvement in smuggling out cheap Iraqi oil. Army spokeswoman Squadron Leader Linda Sawers played down the disturbances as "relatively minor". "The heat, lack of air conditioning and rising temperatures means tempers are boiling over, and soldiers are of course in the line of fire in these situations," she said. She said getting the power back on - a task made more difficult by suspected looting, smuggling and sabotage - was the key to restoring order. Calm was said to be settling on the city as night fell. 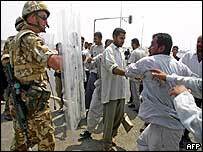 The disturbances came as the UK Government indicated it was willing to go to the United Nations for more support in reconstructing Iraq. Major Charlie Mayo, the spokesman for the coalition forces in the south, denied the violence was aimed at the British. "Some people turn up to calm the situation, and the rioters think let's not throw rocks at the petrol station owner, let's throw them at people who are there to calm the situation," said Major Mayo. "It's normal throughout the world in a riot situation." 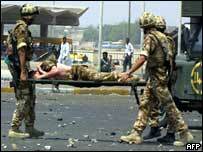 BBC correspondent Jonathan Head, in Baghdad, said the soldiers managed to avert any serious clashes. "But the mood in Basra remains ugly. Patience is wearing thin, the promised reconstruction in Iraq desperately slow," he said. About 10,000 British soldiers have been in parts of southern Iraq since the US-British invasion in March. The soldiers involved in Saturday's trouble were members of the King's Regiment and the Queen's Lancashire Regiment, both of which recruit in North West England. The allies are understood to be preparing a resolution to go before the UN Security Council to encourage more countries to help with the war-torn country's reconstruction. UK International Development Secretary Valerie Amos said in an interview in Saturday's Daily Telegraph that a number of countries were known to be willing to send their troops to the area - but only if there was a UN resolution. The US launched the war on Iraq without seeking a fresh UN resolution. But the spiralling costs, in both lives and monetary terms, of keeping US and British troops in the area, has prompted both governments to seek more support. Russia and France have already called for a UN resolution on post-war Iraq. "Four months after Saddam Hussein was toppled, the people are losing their patience"